Texting My Pancreas: Stuck on Stick Me. So, when Rickina over at Stick Me Designs offered to send one of her deluxe clutch bags over for me to try out last week, I thought, "YAAAY!" (I might have said it out loud, too.) 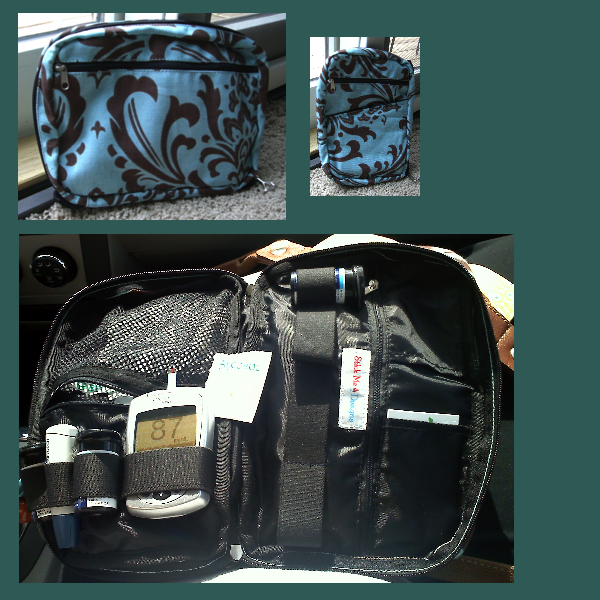 I had never used a diabetes-customized accessory before - I've just repurposed "normal people" items, like makeup bags and media cases. Wrapped in cellophane, just like candy! The bag is pretty fun to use - lots of zippers, pockets, and elastic holsters. (It seemed like I kept saying, "Oh, there's another pocket!" every five seconds after I opened it up.) It was nice to have everything in its own space - not just all thrown into one big compartment, like I'm used to. I found it especially useful to have a bag this size when I traveled last weekend - I could fit all you see in the picture above, plus my Dexcom receiver, cell phone, lip balm, Glucose tabs, Humalog pen, pen needles, and everything I needed for a set change (infusion set, cartridge, and insulin vial) in there, and for the most part, everything had its own compartment. While there are a few things I would have liked to be different (a liquid-resistant outer fabric, for example, for people like me who tend to not realize their finger is still gushing, and smear blood all over everything they touch after testing), I really do enjoy this bag. 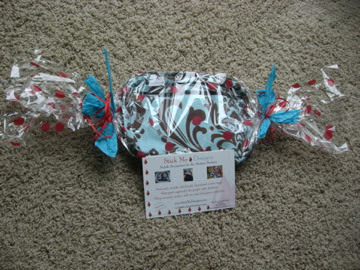 The modern print, in one of my favorite colors, is the icing on the cupcake that is this bag. I also have a big ol' crush on the "Hoot" print she's coming out with soon. Thanks again, Rickina, for the sweet (ha!) bag! You can check out Stick Me Designs' website here, visit their Facebook page, and follow them on Twitter. Disclosure: Stick Me Designs sent me this clutch bag for free, with the understanding that I would share what I thought of it on my blog - good or bad. Wow, that is such a cute bag Kim! Joe is all about the black ~ boring. As a happy Black Zipper Case User, I must disagree. I like "blending in" with my non-designed just regular old case... But that's just me. And Joe. Maybe it's a boring guy thing. Of course, that didn't stop me from getting my actual meter pinstriped. I am a contradiction to myself. Anyhow, you go ahead with your bad, flowery-case self Kim! I won't hold it against you! I love the bag! I struggle deciding if our bag should be more cohesive to the boy style, or if it should be more of my style. I'm the one carrying the stuff around...but the boys are the ones who actually USE the things inside, and they don't like a flowery case. :( I want flowers! I guess I need to stay with boring for now...but I'm going to check out the site anyway, maybe they'll be something to please both the boys and myself. Thanks for the heads up! SO stinkin' cute!!! I juuuuust might NEED one of these... I usually do the cosmetics case thing, too. I love that bag!! Definitely cute and holds everything. I love this! I hate that my meter bag is black :( it always blends in and I hate when I lose it. Love the color as well. wow i love it. i also love COMPARTMENTS. my son could care less just now since hes a baby, i guess dinosaur print or trains would be a big hit. lol. if i were the pwd, now that bag would be a MUST HAVE!! Ohhh, look how nicely your Ping fits in there!!! That's been my main deterant in ordering a new, fancy case or carrier. The Ping meter-remote is so freaking huge, and I worry it won't fit these kinds of non-brand-specific products. I would, however, miss how the meter is held in the ugly black case. I don't have to take it out to see it well, add the sample without smearing the inside, and push the buttons without thinking about where my thumb is. My ugly black case has started to tear on the inside, and I've thought about maybe taking out that little frame I like so much and trying to incorporate it into a home-made case that's actually CUTE.